Ah, shopping. One of my favorite words. If shopping were a person, we’d be frenemies — as I only talk to her when I either need something or I need a good therapy session. Plus, she gets mad at me because I only treat her to lunch at the food court. Anyways, this week in our Working Closet series is shopping. So far we’ve cleaned out our clothes, assessed our needs and organized our mess so we are very well prepared to go shopping. Remember when I told you to make a list in the assess section? Well get that list ready, girls and boys, we’re going shopping. 1. Get your list on. Just like I mentioned before, create a closet shopping list much like you would a grocery list. Obviously, it will not be necessary to fulfill this list each week (no matter how you look at it, you won’t starve without clothes) but it is necessary to know what you need for when you do go shopping. I keep my list on my phone, so that I can remember what I need versus what I want. 3. Shop more, not less. Wait — what did I just say? You heard me. Shop more, not less. No, the world economy and all of the retailers in it are not paying me to say that. What I mean is this: Shopping intentionally takes time and energy. I am constantly “shopping” but I’m not spending a dime. Since I like stores like J.Crew, Loft or Gap, I have to keep an eye out for deals or sales. I rarely buy something full price at those stores. Since I live an hour away from the closest mall, creeping by every day and asking “having a sale yet?” isn’t an option. Instead I keep an eye on sales by signing up for their emails and getting on their mailing list. Just this week I got 4 coupons in the mail alone and even more emails telling me about their sales. Now, if I needed something and I have money for it on my budget, this would be the time to shop. But my list has been checked off and I have no more money to spend this month. So I will by-pass these savings, as you aren’t really saving money by buying it if you don’t need it. *I should also note that this really applies to shopping retail. If you prefer shopping thrift or second-hand, the best thing to do is to know when they stock their items (as this will guarantee that week’s best selection) and what days they have their deals. Most thrift stores have the same deals each week (Saturday is $5 bag day at my local Salvation Army), so be sure to ask when they have their discount days. 4. Choose quality over quantity, every time. Some people ask how I can afford the items that I do and at full-price I can’t sometimes. But this is something I’ve learned over my years as a shopper, I believe Shakespeare said it best: “tis better to by 1 really nice item you will wear a lot, than 5 really crappy items you will wear once.” It took me a lot of wasted money to figure this out. 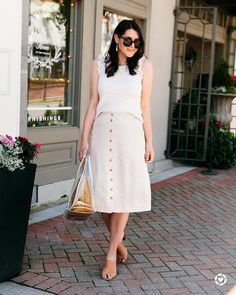 I would spend $100 on 5 or 6 things that I never wore and then lust over 1 skirt at J.Crew that I would probably wear all of the time, saying I could never afford that $100 skirt. Well that was true, because I was literally throwing my money away on cheap items that I only bought because they were cheap. When you spend money on a nice piece, it is an investment. Therefore you want to treat that piece well and wear it as many times as possible. For me anyways, I have to watch what I buy and make sure that it’s the quality I’m buying and not because it’s on sale. I try to stick with higher quality items that I know will stand the test of time. Even if that means I can only buy 1 or 2 items that month. Here is a good rule of thumb that I use when something is on sale: “Would I buy this item at full-price?” If the answer is yes, then I have no heartburn in buying it on sale. If I waiver on it, then I put it back. 5. Set a budget. (This perhaps should have been the first rule. Oh well. Mix ’em up in whatever order you’d like.) Everyone’s budget looks different, just make sure you have one. Maybe you can spend $100 a month on clothing or $100 every three months. Whatever your budget is make sure you know it and most importantly that you follow it. It helps me to let my husband know each month what I can spend. Because he will call me on it every time if I try to go over. The responsible part of my brain calls this accountability, the irresponsible part of my brain calls this annoying. Either way it’s good to stick to my budget. And please know that building your wardrobe does not happen with one shopping trip nor does it have a specific time tied to it. Building your wardrobe is a constant cycle of ebb and flow, so don’t worry about finding a complete wardrobe in one day. That would be exhausting. 6. Whatever you buy, make sure it fits. And I don’t mean on your body. Well I do — it should fit your body, do not buy clothes too big or small that would be ridiculous. But I mean it should fit into your wardrobe immediately. If you have to buy 2-3 other pieces just to be able to wear something, then what the heck are you doing buying it? If it doesn’t naturally fit in your closet, then you probably won’t wear it. I’ve proven this fact over and over again. Who knew that all my years as a shopaholic I was just doing research for my blog to help you guys? Staying with a budget….its been one of the hardest things to follow but it sure helps you so much when it comes to savings and all that 🙂 I love your closet posts I'm following you religiously! Thanks so much for the great tips. Just discovered your blog 2 days ago and have already purged my closet, assessed my closet needs, and organized the best I could ( share a small non walkin closet with my husband). Now I am ready for this step. Got my needs list in my bag and making a trip to the big city. I'm also going to do the 30 for 30. I am too excited. You have saved me from a clothing rut and taught me that i DO have stuff to wear. Thank you so much Kendi for your inspiration, knowledge and guidance. Follower for life. I'm finally getting around to reading this and I LOVE it. Just one tip that I've found very helpful: make a Pinterest board for online shopping (or a couple, if you want to divvy it up by item). That way when I'm cruising blogs, I can click on the link for an item I like, pin it, and return to reading. Every couple weeks I'll pick items from that board that still jump out at and me and start my comparison shopping. It prevents me from making rash decisions or completely forgetting about something that I loved. Try to save the most money by investing the most you can in something you'll wear a lot. I think the most exepnsive piece I own is a winter overcoat. But I wear it evey day it's cold enough to, it fits like a dream and I feel so beautiful in it! It's an example of a great investment but if I bought a new coat each year I could not afford anything half as nice.